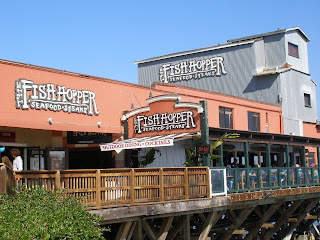 Exterior of the Fish Hopper, located on Cannery Row in Monterey. The fish and chips from the Fish Hopper. 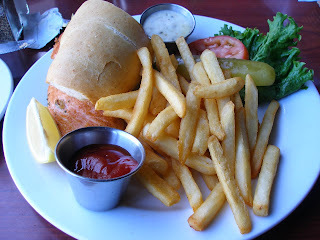 Grilled salmon sandwich from the Fish Hopper. 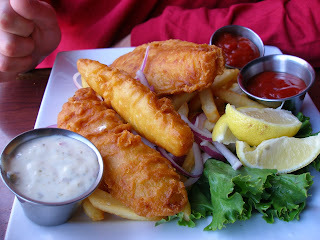 The Fish Hopper on Cannery Row provides a great selection of seafood at reasonable prices. The service here is always excellent, as is the food. The view is also highly recommended as it is overlooking the water. 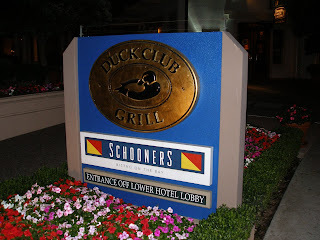 Schooners Bistro on the Bay at the Monterey Bay Plaza Hotel & Spa is more of a sports bar with great food, as it has the requisite TVs tuned to various sporting endeavors; as the name implies, however, there is a sailing theme to the decor. The food is quite good and the prices reasonable. There is also an outdoor heated terrace for those cool Monterey nights. They have excellent seafood selections and I really like the "Grilled Castroville Artichoke" appetizer. Ambrosia India Bistro is located in the middle Old Monterey. It is an excellent choice if you are looking for something other than seafood. The food is excellent, as is the service. They have a festively decorated outdoor dining area, as well as a cozy dining room inside. The have a lunch buffet daily, including a champagne buffet on the weekend. I ate here for dinner and enjoyed every dish I ordered, especially the Vegetable Pakora vegetarian appetizer. Obviously, if you are looking for vegetarian fare, Indian food is always a safe bet. These above are just some of my favorite places. There are also many other good dining options, such as the Chart House (high end steak and seafood chain), El Torito Mexican Restaurant & Cantina (good Mexican food, inexpensive prices), and a variety of other good places. One caveat...do not be lured into going to the "world famous" Sardine Factory. The food is bad and the service worse. My boyfriend and I spent almost $200 on what was supposed to be a nice, romantic dinner. The food was not good and way too expensive for the quality. My boyfriend ordered the filet and lobster. The lobster was rubbery and the filet, which he ordered medium rare, looked like a charcoal briquette. The waiter played least in sight and when he was around, wasn't to the level of service he should have been at this type of restaurant. So, while you may be tempted to try the Sardine Factory...don't. In fact, our dining experience at the Sardine Factory was so bad I wrote a letter of complaint. The restaurant wrote a letter of apology and sent me a $50 gift card. However, this card will never be used, as our experience was that bad. Not even free money is worth a return visit.